Atmosfera extends its range of pv equipment, having added them with inverters from leading global trademarks SMA, Fronius, SolarEdge, Kostal, Omron, Kaco and Delta. 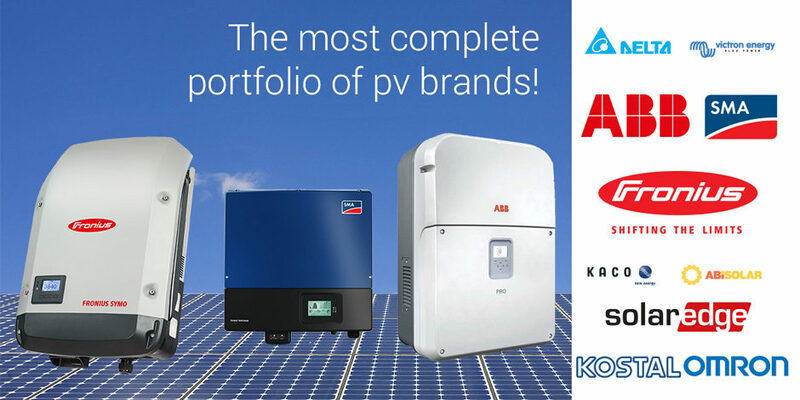 The new brands will add the portfolio of the company that already includes ABB, ABi-Solar and Victron Energy. At present moment Atmosfera has the most complete portfolio of offers for pv equipment in Ukraine. This replenishment of range took place within the new commercial strategy of the company according to which Atmosfera strives more fully to meet the demand on inverters, charge controllers and energy storage systems in all market segments and for all tasks. The new strategy means not only the formation of competitive price quotations, tariff policy but construction of efficient logistic schemes for direct supplies of equipment to Ukrainian market. The company thinks that its main task is to form the operatively replenished stock reserves, as well as to build the schemes for service support and warranty replacement, including “hot” one. The engineers of Atmosfera constantly study the offers from leading world manufacturers of pv equipment, so, in the nearest time we can expect the appearance of new models in the catalogue of the company. The leading German (and, perhaps, world) manufacturer of inverters for solar energy. These inverters have the best performance of efficiency, the least weight and sizes. Buying inverter of SMA, you receive the device, where the newest developments for transformation of energy that comes from pv modules are used. Standard warranty for all inverters – 5 years. Austrian manufacturer of solar inverters. The company has more than 20 years of working experience in the market of pv electricity. The inverters of Fronius are equipped with the system of quick assembly SnapINverter, are ready for use in Smart Grid networks, have the integrated Wi-Fi monitoring. They are light and compact transformerless inverter with one of the best KPI in its class. Standard warranty for inverters of Fronius – 2 years. Israeli manufacturer of inverters that uses the innovative technology for optimization of performance by pv modules. The optimizer that tracks peak power point is installed to one or two modules with inverters SolarEdge, and the inverter is engaged only in transformation of direct into alternating current. Standard warranty for inverters – 12 years, warranty for optimizers – 25 years. German manufacturer of network solar inverters that has more than 100 years of working experience in the market of electronics. These inverters have up to three integrated MPP-trackers and an integrated electronic automatic AC circuit breaker. The available integrated monitoring (Ethernet), possibilities for integration into “smart home” system (KNX, EEBus), counter S0, support of RS485 protocol and other options in basic configuration make the products of Kostal to be the best combination of price for a number of options in inverter. Japanese manufacturer of electronic equipment. It produces only one model of network pv inverters with capacity of 10 kW. The model has the integrated function for prevention of degradation at pv modules (PID), 3 MPP-tracker, caused by difference of potential. The maximum peak capacitance is at the level of +10% from nominal one. Standard warranty – 5 years. German manufacturer of network solar inverters that has been working in the market of pv electricity since 1999. The inverters Kaco have the best ratio of price-quality. Thanks to function Priwatt you have the opportunity to use the electric energy for own consumption without output to the grid without high expenses for additional equipment for implementation of it that will allow starting saving on installation of the system before connection of feed-in tariff. Standard warranty for series BLUEPLANET – 7 years, for series Powador – 5 years. Delta — Dutch company that has been producing the inverters in the middle price category since 1999. They are simple, maintenance and installation friendly inverters that do not require any dismantlement for implementation of necessary connections, with a wide range of operating voltages. Without integrated monitoring.